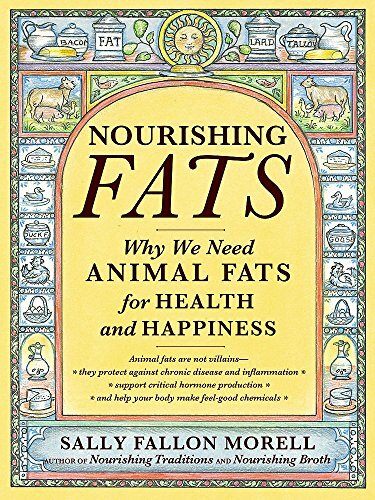 Sally Fallon Morell has written a new book, published last month, titled Nourishing Fats: Why We Need Animal Fats for Health and Happiness. In a smoothly flowing 182 pages, she shows why saturated fat and cholesterol are not the villains they are made out to be. Nourishing Fats: Why W... Sally Fallon Morell Best Price: $6.49 Buy New $6.08 (as of 04:20 EDT - Details) In the first chapter, “The Greatest Villains,” she tracks the unfolding demonization of saturated fat and cholesterol. It began in 1912 with the pernicious marketing of Crisco—its name comes from CRYStalized Cottonseed Oil—by Proctor and Gamble. The company promoted this hydrogenated trans-fat, first used to make candles and soap, as a “healthier alternative to cooking with animal fats.” At the time, Americans used lard (pork fat), tallow (beef and lamb fat), and butter for cooking and baking food. She next addresses the fake science of cholesterol studies in rabbits, who as herbivores are not designed to digest animal fats and cholesterol. Then there is the Framingham Heart Study, where largely ignored follow-up reports contradict its initial findings that high cholesterol blood levels cause heart disease. She shows how the 1977 McGovern Report advocating low-fat “Dietary Goals for the United States” and the 1984 Cholesterol Consensus Conference have played fast and loose with the science. The healthiest butter comes from cream that free ranging, contented cows eating grass in sunlit pastures produce. This butter has a natural deep yellow color indicative of high levels of Omega-3 fats and fat soluble vitamins. Butter from industrially confined cows denied access to green pastures has 10 to 13-times less vitamin A and 3-times less vitamin D than grass-fed cows. My wife and I consume Amish butter, which we purchase at a local grocery store in the small town where we live. Amazon has it. She dedicates Nourishing Fats “To the memory of Mary G. Enig, PhD” (1931-2014), her long-time colleague, friend, and coauthor of key articles and books. 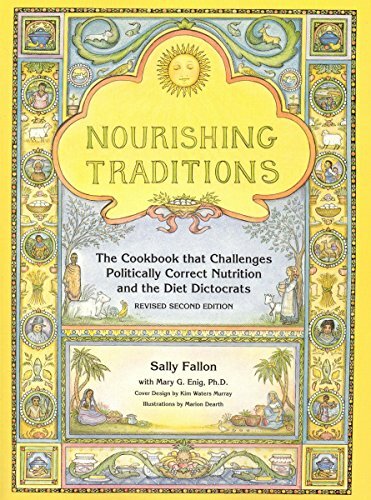 The two books they wrote together are Nourishing Traditions: The Cookbook that Challenges Politically Correct Nutrition and Diet Dictocrats (1995) and Eat Fat, Lose Fat: The healthy Alternative to Trans Fats (2005). More than 30 years ago, Dr. Enig exposed the connection between trans-fat margarine and heart disease and cancer. The medical establishment first ignored her, then vilified her, and finally years later treated her findings concerning trans-fat as an unsurprising, obvious fact. Sally Fallon Morell is a skilled writer with a sharp scientific mind. She cites 707 up-to-date references in this book, which I was pleased to see includes this one: “Statins stimulate atherosclerosis and heart failure: pharmacological mechanisms,” by Okuyama H, et al., in the March 2015 issue of Expert Review of Clinical Pharmacology (volume 8, pages 389-99). This book also has 32 pages of recipes and 22 pages of notes. A careful reading of Nourishing Fats: Why We Need Animal Fats for Health and Happiness will change what you eat and thus improve your health. Despite what the medical establishment, government health authorities, pharmaceutical companies, and the soybean industry still say, saturated animal fats, saturated tropical oils (coconut and palm oil), and cholesterol are not villains. Orthodox claims that they are bad for us wilt and become thoroughly discredited when held up to scientific scrutiny. 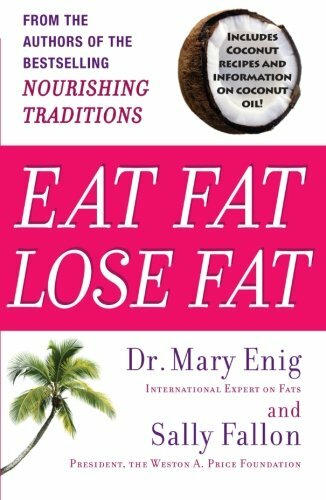 Eat Fat, Lose Fat: The... Mary Enig, Sally Fallon Best Price: $0.98 Buy New $5.02 (as of 12:40 EDT - Details) I address this subject in my 2011 Lew Rockwell article “Enjoy Saturated Fats, They’re Good for You!” It is drawn from a talk I gave on saturated fats earlier that year at the 29th Annual Meeting of the Doctors for Disaster Preparedness in Albuquerque. This 53-minute talk is available on YouTube HERE (there have been 325,000 views of it so far). Some of the slides I used in that talk are reproduced in this LRC article. Graduating from medical school in 1965 and pursuing a 40-year career as an academic member of the medical establishment performing and teaching heart surgery, I unquestioningly adhered to the low-fat creed. For far too long. Then, in 2005, I came upon an article that Mary Enig, PhD and Sally Fallon (now Sally Fallon Morell) wrote titled “The Oiling of America,” first published in the magazine Nexus in 1999. This article stimulated me to look more carefully into the matter and discover that the conventional wisdom regarding saturated fats and cholesterol is false.